Click the headline of the item you want to blog about. The content will be displayed below. Select some text to quote and comment on. Click the icon for your blog type. The editor will be displayed with the content you selected already formatted and linked for you (if you didn't select anything, the first part of the content will be quoted automatically). Add some comments to give your content unique value. 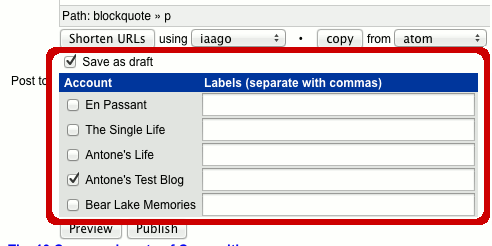 Set any options you wish, and choose which blog(s) to publish to. Select up to 3 Twitter accounts at once, or unlimited WordPress, Blogger or Tumblr blogs. When everything's ready, click "Publish". Your content will be posted to all selected accounts* with one click. 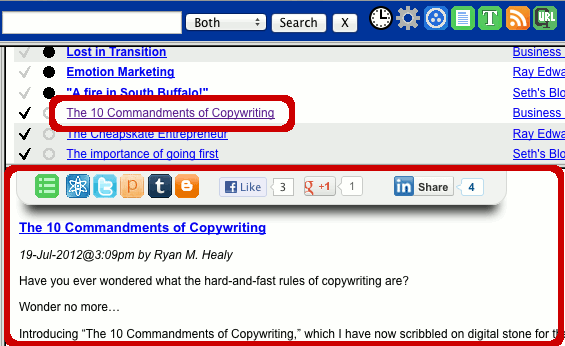 * Each service (blogs, Tumblr & Twitter) has it's own "Publish" button. Click the "Publish" button for each service you wish to publish to. 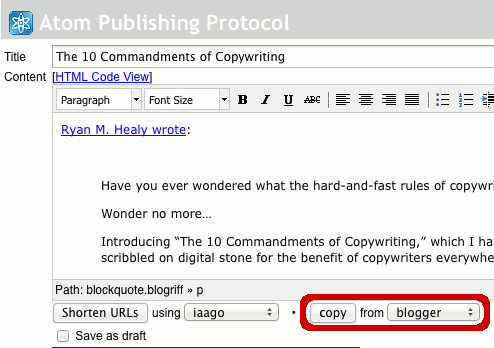 If, for example, you have multiple WordPress blogs selected, Blog Riffer can post to any number of them with one click.